I have 3 tasks called Task1, Task2 and Task3. I would like task 1 to have a periodic activity (say 50Hz), and tasks 2 and 3 to be updated right after Task1::update() finishes. I could use FBSched to get several tasks executed in a row (on the same thread). 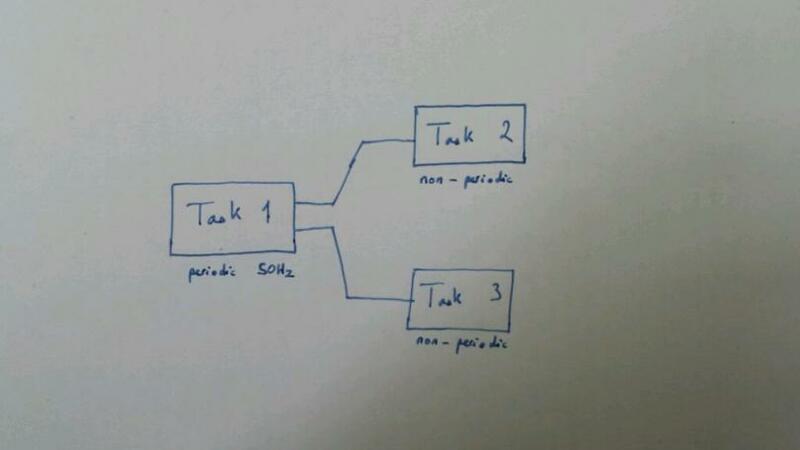 But what I want is to have Task2 and Task3 update in parallel (check my scheme below). I am not too sure which setup to use in order to achieve the task synchro (in either of these configs). Let's say I try to setup config B). I was thinking of using event ports to wake Task2 and Task3 up on Task1's update completion. But then my question is: will the activation of Task2 and Task3 be fast and deterministic (ie: do I keep the realtime-ness)? I ask this question because from what I understand of orocos, the events received by Task2 and Task3 are queued in their respective ExecutionEngines on reception (this is RT). But I am not sure when the ExecutionEngine is stepped (ie when it is awakened). Is it straight away after the event is queued (in which case the setup keeps realtime-ness) or is it stepped at another moment (potentially breaking RT)? Submitted by arennuit on Fri, 2015-08-28 16:25. Submitted by fosini on Mon, 2015-08-31 07:44. The image is not shown in the email message. > either of these configs). > I keep the realtime-ness)? > another moment (potentially breaking RT)? new data arrives to the port. Submitted by arennuit on Mon, 2015-08-31 10:35. From what I understand crossing your answer and other readings, the component awakening mecanism on event is RT but there is a minor overhead associated to it (for the thread awakening I guess). Does this mean that when using strictly sequential activities FBSched should be used (in order to reduce scheduling latencies - as stated in the FBSched doc https://github.com/kmarkus/fbsched) and when more complex control architectures are expected (like the one in the above scheme) the event awakening mecanism can be used? Basically the component awakening on event has a small overhead but allows more complex architectures, is that right?